This is my first item for the Colette Palette challenge. 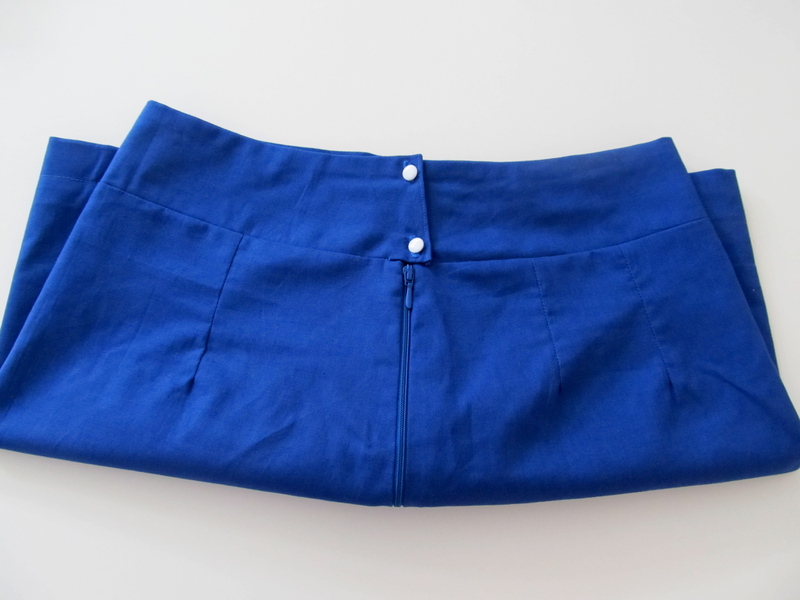 It’s sort of a wearable muslin to try out my skirt block (made using this tutorial). I’ve used that tutorial to make skirts for my boyfriends sister, but never for myself, so I never really knew how they fit. I found that it’s best to insert a high hip measurement in to the block. The shaping from my waist down to my hips was well off, so even though the block looks really straight at the top now, it fits much better. I also extended the darts on the back and front. There was just a tad too much material bunching in the front, there still is a bit, and extending the darts helped. On a really positive note, the waist band is almost perfect. Fits like a glove! Rather obvious how it relates to my palette, but I am really in love with this colour at the moment. I also have a pair of pants in nearly this exact tone, which my lovely mother sent for Christmas. Note the bunching in the front. I will play with the darts a bit and see if I can fix that in the next run. I really like the length of this skirt too. Not too short but if it were any longer, I would have had to add a split somewhere to aid with walking. I think the back fits pretty well. I had to adjust the darts here too and made them longer. Same thing as the front really; too much material where there shouldn’t have been. Ta-dah! 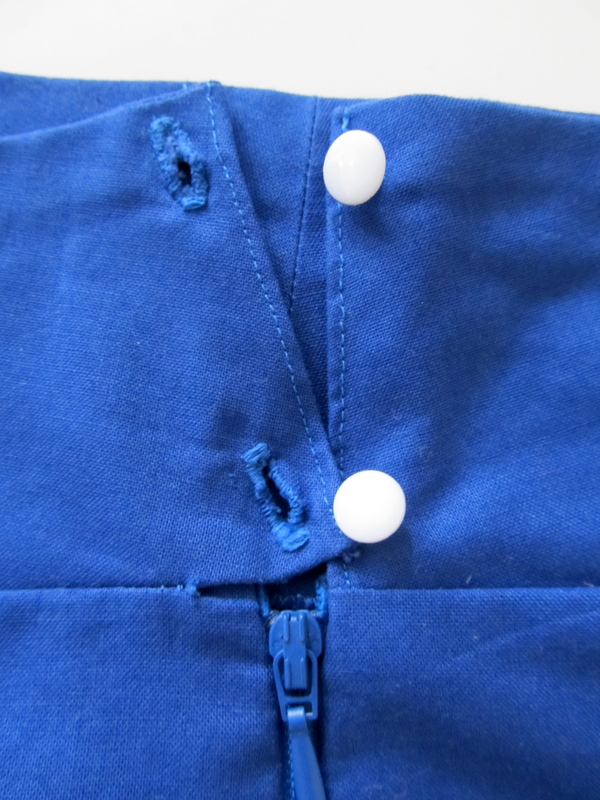 Though not the tidiest and most pretty looking, I did my first button holes! Turns out my basic little machine can handle them. The top one is the worst as I had cut through the middle when I realised that there was a wrong and a right side to sewing them. Oops! Got it fixed for the second one though. All in all, I’m pleased with the skirt and it will get worn a lot over summer (if it decides to turn up in Denmark, I’m having my doubts). First time I’ve ever made a muslin (of sorts) for anything and the first time for button holes! In the words of Barney Stinson, “self high-five!”. Next, I’m tackling something to go with the white part of my palette. I love the look of the white with this blue, don’t you? Well done on drafting your own skirt. Far more satisfying than using someone else’s design don’t you think? I really must get round to making a block for me. So thank you for the link… much appreciated. Fab colour too! Much more satisfying! And more often than not, it fits better because its tailored to you. The skirt block is the easy one. Im working on the body block now, very slowly as I translate from Danish. Wish me luck! I’m seriously thinking of abandoning all projects so I can concentrate on a skirt block this weekend! Good luck with the body block. That sounds a bit more tricky! You are currently reading In to the blue at A La Amelia.